Habitat: drained, acid soil to neutral. 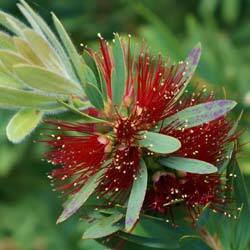 Callistemon fears frost. It is adapted well to Mediterranean climate. In the North, it can be planted on full earth sheltered from a wall. Leaves: persistent, green-dark, lanceolate. They give a light lemon-flavoured smell when crushed. They are slightly crimson in the bud. From 5 to 10 cm long. 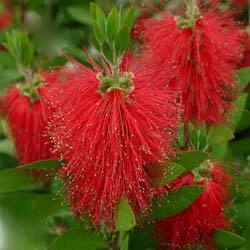 Flowers: bright red in cylindrical spikes, like tooth brush or bottle brush (hence the nick name), from 5 to 15 cm long. In July-August (in May, in greenhous, according to the conditions of sunshine, but flowering is very abbreviated). Fruits: Woody Capsules adhering to the stem several years.